Skills® is an online tool that provides comprehensive assessment and curriculum, positive support planning for challenging behavior, progress tracking, and treatment evaluation all in one place. Assessment: The most comprehensive evaluation of a child’s skills available. Eight Curricula: Activities with step-by-step instructions for teaching children with autism the skills they need. Positive Behavior Support Planning for Challenging Behavior: A tool for creating, customizing, and storing behavior intervention plans (BIP) for challenging behavior. Progress Tracking: Charts and graphs that track treatment progress and the impact of various events on the child’s progress. Analytics: Prediction of probable clinical outcomes given specific parameters , team evaluation and cost analyses. 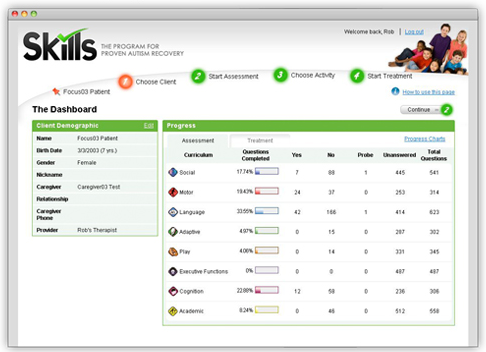 This menu summarizes the progress a user has made with regards to completing the Skills Assessment, the activities currently in the child’s treatment plan and the activities the child has mastered.